Crews in San Jose were busy Tuesday rescuing people and pets trapped in cars and homes swamped by rising flood waters along Coyote Creek. Nearly 200 people and more than a dozen pets living in the Rock Springs neighborhood near Senter Road and Phelan Avenue were evacuated as rainfall-fueled runoff from the nearby Anderson Reservoir inundated low-lying and already saturated land with water. Flood waters tall enough to cover cars and creep above front doors forced rescue teams to deploy boats and go door-to-door searching for stranded residents and motorists. Utilities were also immediately turned off. "They said we had 10 minutes to pack the things we wanted to bring," said 10-year-old Jaycey Manuel, who threw some clothes into a backpack and rode with neighbors to higher ground. 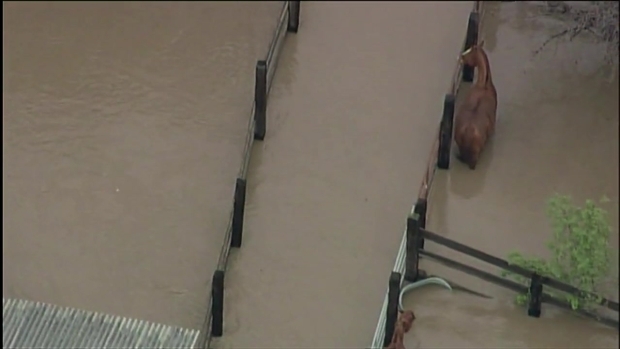 Horses have been stranded by the rising flood water in San Jose. San Jose Mayor Sam Liccardo visited the scene, and said, "We've had very serious flooding. 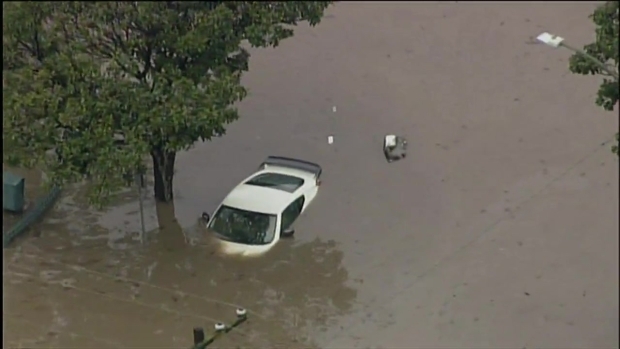 We've got several feet of water that has inundated cars and an entire story of homes." An estimated 500 households, which include roughly 60 multi-unit apartment complexes, were impacted by the rising water, according to Sam Liccardo. "We've got all hands on deck right now," Liccardo said. "Everybody in this city is working hard to do whatever we can to safeguard our residents." The mayor late Tuesday announced the city was expanding the mandatory evacuation order to nearly all residents east of Coyote Creek, but west of Highway 101. The evacuation order does not include the Bonita neighborhood, Liccardo said. Earlier in the day, five homeless people were rescued from the nearby Los Lagos Golf Course after swift-moving water surrounded their encampments. "We knew we would have flooding in San Jose. We did not know how bad it was," the city's fire Capt. Mitch Matlow said. City officials on Tuesday declared a local emergency in response to the dangerous flooding. A mandatory evacuation order was implemented in the Rock Springs neighborhood, Liccardo said. A voluntary evacuation order was issued for those residents living along low-lying areas of Coyote Creek between Capitol Expressway and Interstate 880. Matlow said the situation at hand is unlike anything he's ever seen during his 35 years of working in Santa Clara County. "This is the worst flooding and water rescue situation that I have personally participated in," he said. "I was involved in the (1982-1983) flooding that we had that was mostly in downtown and in Alviso, but I don't recall us having to pull this many people out by boat." Rain is tapering off in the area, but a flood warning for central Santa Clara County will remain in effect until further notice. Residents in the area are being advised to grab their belongings and leave their homes until the water level subsides. An overnight evacuation center has been set up at James Lick High School at 57 N. White Road in San Jose, according to city officials. Two other temporary evacuation centers have been opened at the Mayfair Community Center on Kammerer Avenue and Shirakawa Community Center on Lucretia Avenue. 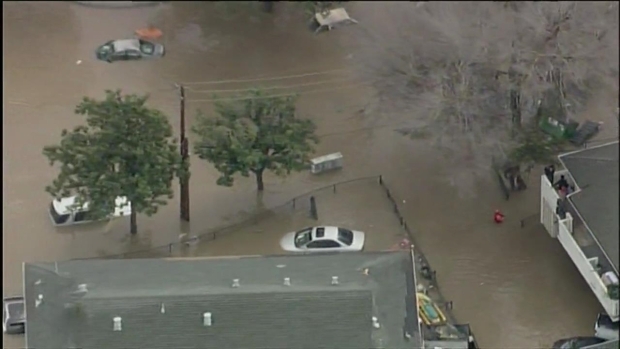 NBC Bay Area's SkyRanger captures flooding in San Jose that has forced several people to evacuate. Before evacuees can journey to safety, fire crews are decontaminating those who come in contact with flood water, which has been polluted with gasoline, oil, sewage, chemicals and other debris. "This is not clean swimming pool water," Matlow said. "The water that is coming through here is contaminated. Everyone that has been in that water needs to be decontaminated." Coyote Creek is expected to remain at flood stage until Wednesday night. On Tuesday evening, parts of the South Bay Mobile Home Park in San Jose's Berryessa neighborhood became flooded and nearly 200 residents were asked to evacuate amid fears that a wall in the back of the community could collapse. Video from the scene showed people wading through putrid, knee-deep water, while a police cruiser and some cars slowly drove through. Officials said people also left their homes in the water-logged Golden Wheel and Riverbend mobile home parks. 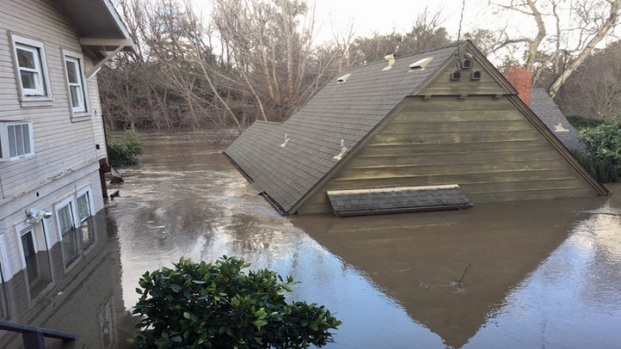 In addition to homes submerged near Coyote Creek, a second San Jose neighborhood was forced to evacuate from their homes to due rising flood waters. Elyce Kirchner reports. City officials said they have been warning residents along Coyote Creek to prepare for potential evacuations for a few days as a result of the rushing water flowing from Anderson Reservoir, according to city spokesman David Vossbrink. On Saturday, water started spilling over Morgan Hill's Anderson Reservoir for the first time in 11 years. "We have been sharing information regularly over the past several days advising residents in the entire community about high flows and Coyote Creek, particularly those areas that are close to the creek," Vossbrink said. Rescue operations were implemented in San Jose as a result of rising flood waters along Coyote Creek. That information was shared via NextDoor, social media and news outlets, Vossbrink said. Despite sending out information, Vossbrink admitted that the amount of water flowing out of Anderson Reservoir is unprecedented. "The water district is telling us that they're not seen this level of flows coming down the Anderson spillway in their experience so that really does create a situation that is new for everybody," he said. With water rising in her apartment building on South 12th Street in San Jose, Alondra Calderon and family of seven had just minutes to evacuate on Tuesday. “They told me we need to take what really important to us, and I am really scared because it’s really flooded,” she said. VTA buses transported the complex's residents to nearby James Lick High School, where they will be staying indefinitely. Fire officials say the extent of the damage is unclear. The parking lot and all first floor apartments of the complex have been badly damaged, and officials are concerned that the water could swell again. "They said that we can’t come back for three days maybe," Calderon said. 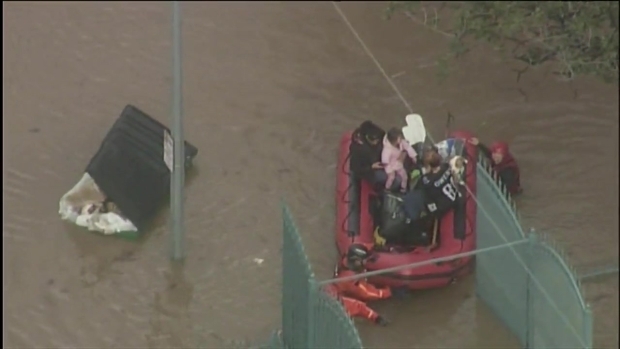 Crews in the South Bay are busy Tuesday morning rescuing people trapped in cars and homes swamped by rising flood waters along Coyote Creek in San Jose. Aside from the deluge of recent rain that caused water levels along the creek to rise, Liccardo added that some sort of breach in the creek made matters even worse. "We're still trying to nail that down now, but clearly there is a source in the creek where there is a significantly large amount of water that is rushing in," he said. "This is more than the typical inundation." Regardless, Liccardo suggested that something still went wrong with planning for this major event. "As I sit here today and look at a neighborhood that is completely inundated with water where we have fire crews doing whatever they can to get people out, there's no question in my mind there was a failure of some kind," he said. "We'll have plenty of time for 'Monday morning quarterbacking' in the days ahead. Right now, we've got to do whatever we can to get people out." Some evacuees said they had been caught off guard when they were forced out of their homes, but were grateful for the help they got from officials, and sometimes their own neighbors. "They didn't have any warning,” Gabrielle Martinez said. “They said it was going to flood a little. That's it. They didn’t tell us anything like this was going to happen. People should have had warning." Janet Martinez agreed: “We got a call this morning to come back over here and everything is gone." Serious flooding upstream along Coyote Creek also forced the CHP to close northbound Highway 101 in Morgan Hill. The northbound lanes at Cochrane Road could remain closed through 11 p.m. Wednesday, according to the CHP. The water is expected to start receding around 3 a.m. Wednesday. Engineers will then have to check the integrity of each building before the massive cleanup begins.